The Lake Wisconsin boat launches on Tipperary Point opened up the first week of March. The Wisconsin River at the Dells below the Kilbourn dam, has been open since February with recent reports of good numbers of small male walleyes and saugers being caught. 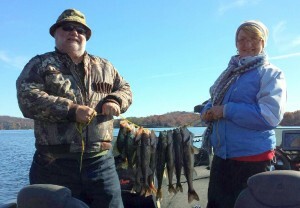 The larger hens should start making an appearance at the Dells any day now as more fish arrive daily. Below the Prairie Du Sac dam, there has been a decent bite, but rising water levels means more gates open at the dam, which can make fishing difficult. Walleyes and saugers have been moving through the narrows at the Northeast end of Lake Wisconsin on their way upstream to spawn in the Wisconsin River below the Kilbourne dam. I fished in the river just above the narrows on 3/12, and that days catch of 16 saugers and only 5 walleyes tells me were likely at the tail end of the walleye run out of the lake and into the river. Saugers should continue to move through on their way upstream to spawn for another week or so. On Saturday the jig bite while drifting downstream seemed slow, so I motored up out of the narrows just into the river, and started pulling 2oz bottom bouncers with a large Northland Tackle Gumdrop Floater with a stinger hook and an extra-large fathead. I was fishing current seams created by points and sand bars in 13’-18’. Slowly motoring upstream into the current at 0.5 to 0.9 mph while letting out enough line to maintain bottom contact was good enough to catch 21 walleyes and saugers with 11 legals (all fish released). The stinger hook was a key addition as the first 6 fish I hooked were lost. Size matters – I found that switching from a #2 to a 1/0 (largest size) floating jig head and sorting out and using the largest minnows in the bucket translated quickly into larger fish caught. The water temps in the river above Lake Wisconsin range from 36°F on Saturday the 12th of March to 40°F on Sunday the 13th of March. Rain in the forecast bodes well for these pre-spawn fish, as the runoff will both warm and raise water levels to flood crucial spawning habitat. Both warming water and longer days will help their eggs to develop, but the actual spawn for walleyes is still likely 2-3 weeks away. They don’t all spawn at once however, and the process will likely span into the first two weeks of April. This is a critical time for these fish where they are concentrated and susceptible to overharvest. Fish are renewable, but every one taken at this time cannot contribute to building future populations. Please consider selective harvest or catch and release to ensure there is plenty of fish for the future. By some twist of fate, the bite for walleyes and saugers has not improved very much yet this fall. There have been some ”ok” days, but not a lot of consistency as we wait for water temps to cool, stabilize, and concentrate the fish in predictable areas. Standard tactics such as trolling crank baits and jigging have been inconsistent at best, but one technique that has been producing some fish is the old tried and true Lindy Rig. This really is a simple way to methodically work an area and entice walleyes and saugers to bite when the going gets tough. There are just a few components to the rig though variations will allow for greater opportunities. To rig up, do the following: thread a walking sinker on the main line to the rod, then tie on a barrel swivel. Next tie a 3’ leader of 8lb test monofilament from the barrel swivel to a size 4 or 6 octopus hook. The hook should be snelled for best hooking percentage. Options for the rig include adding a colored bead or float on the snell above the hook, or a floating jig head in place of the hook. If you use minnows, go with a size 4 octopus hook. If you use leeches or crawlers, use a size 6 hooked right through the sucker on the tail of the leech, or once through the nose of the crawler. A small bubble of air injected into the tail of the crawler will help to float it. The size of the weight will depend on the depth your fishing and the speed your boat is moving. For depths of 10’ or less, use a ¼ oz. walking sinker. For depths from 10’-15’ try a 3/8 oz. walking sinker. For depths from 15’-20’ use a ½ oz. or a ¾ oz. walking sinker. The weight required will vary depending on how fast the wind, current or your motor moves you along. Using spinning tackle, open the bail and drop the bait to the bottom. Leaving the bail open, keep the line on your finger as you move the boat with the electric motor or allow the wind or current to drift the boat along the structure your fishing. This is typically a slow presentation, and I like to crawl along at 0.5 to 1 mph using enough weight to keep my line at around a 60° angle. In water less than 10’ deep, increase this angle to keep the bait farther back behind the boat as the boat can spook fish. When you do feel a bite, drop the line off your finger and immediately strip off several feet of line so the fish does not feel any resistance. Count from 1 Mississippi to ten Mississippi, and close your bail. Slowly reel in your slack, and if you feel the weight of the fish, set the hook! If you miss the fish, next time count from 1 to 15 or 1 to 20 to give the fish time to chew its way up the bait. The whole point of the open bail and the walking sinker is to allow these neutral to negative fish adequate time to take the bait fully in their mouth without feeling any resistance as the line flows off the reel and through the sinker. If they are aggressively hitting the bait, then another faster paced presentation is likely to work also, and allow you to cover water more efficiently. Additional options to try with bait are tail hooking your minnows so that they struggle more, or hooking the crawler once through the middle in order to give it a “U” shaped “wacky worm” profile popular in bass fishing. Hooking the worm through the middle gives it a shorter profile and can help with short strikes. 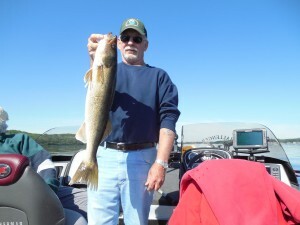 The Lindy Rig has been in use for around 50 years and has accounted for countless walleyes caught. Isn’t it time you rediscovered this old favorite? 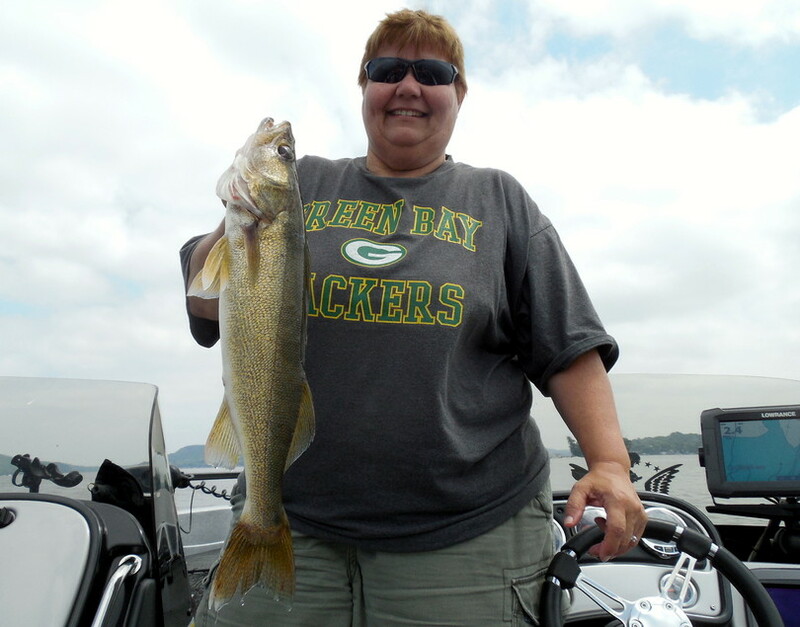 With the warming temperatures, both walleyes and saugers on Lake Wisconsin and the Wisconsin River have started to transition into summer patterns. It was a challenge throughout the month of May to establish any kind of a pattern that lasted more than a day or two. The seemingly “every weekend another cold front”, and abundant flow coming down from the Kilbourne dam has impacted fish locations on a day-to-day basis, and we’ve found it necessary to keep moving to contact active fish. But now it’s June, and we’ve finally turned the corner into easier and more consistent fishing. I’ve been finding success using two techniques lately, trolling size 7 Berkley Flicker Shads behind planer boards in 8’-10’ at 1.7 to 2.8 mph (SOG) and pulling Slow Death rigs on bottom bouncers in the channel in 15’-20’ of water at 0.7 to 1.0 mph (SOG). The trolling bite has been steadily improving, though I’ve found it necessary to make either a lot of turns, or play with the throttle constantly to trigger bites. When trolling, if you turn to port, the “outside” lines, or starboard side baits will speed up and the “inside” lines or port side baits will slow down. If you turn to starboard, the opposite is true. This sudden change of speed and direction WILL get you bit more consistently. If there is significant boat traffic or other obstacles that prevent making a lot of turns, simply rapidly increasing/decreasing your speed every few minutes will work too although the directional part of the equation is removed, it is still effective. An example would be if you’re pulling baits at 2mph, goose the throttle and speed up to 3mph for 5-10 seconds then slow down to 1.5mph for 10 seconds before resuming your 2mph speed. If you get bit, make sure to note both the speed and direction as we’ve found many days where we get hit far more going one direction vs any other. Experiment with both speed and direction, but pay attention so when you find something that works, you can repeat it. I have seen what appears to be a definite color preference on some days, but most days these baits are not heavily scrutinized before getting hit, so just stick with the chromes, chartreuses, oranges etc… and you’ll do fine. Most days nearly every color we put out catches a fish. 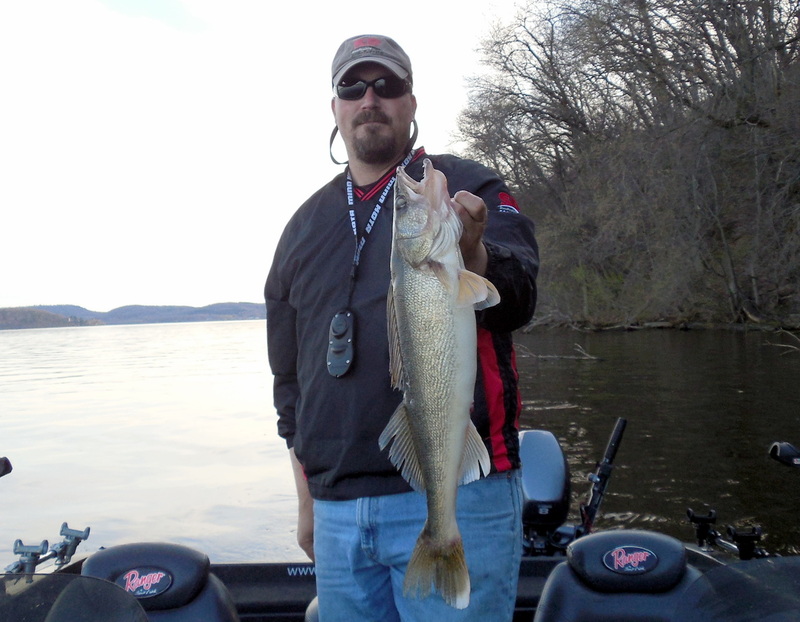 While fishing Slow Death rigs on bottom bouncers, the amount of current, and whether the river is rising, falling or steady, has had a decided impact on locations for walleye and sauger in Lake Wisconsin and the Wisconsin River. I’ve been finding the most success, either when the current is steady or falling. When the river is rising, the increased current tends to push walleyes and saugers out of the channel to shallower locations where current breaks exist. You can still catch them, but they become more difficult to locate and often other techniques are necessary to do so. When Slow Death rigging, carry multiple versions or shades of chartreuse and orange beads in sizes 4mm and 5mm. Again, some days it seems that one particular color is “hotter” than the other, but we routinely run both and catch fish on either color. 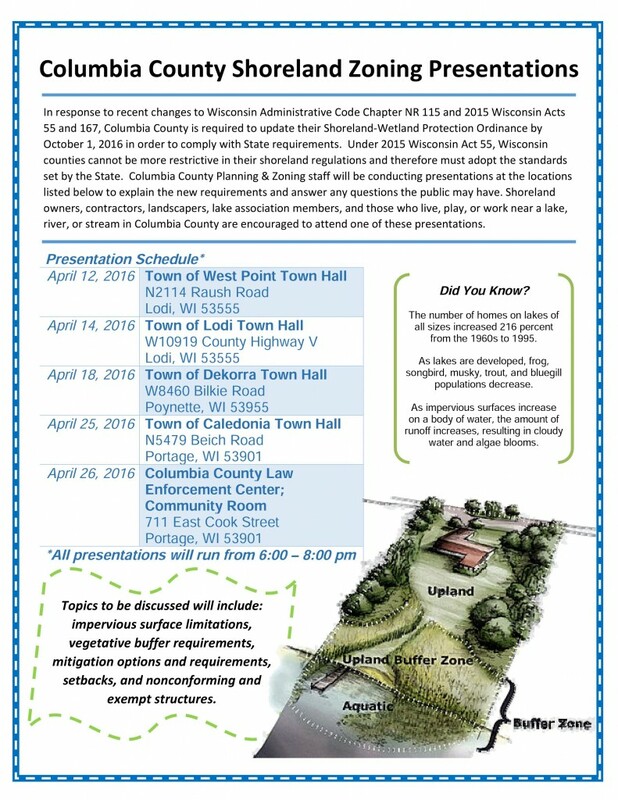 Click on the image below to read the latest issue of Lake Wisconsin Living. This winter has been about the most consistent ice bite I’ve seen on Lake Wisconsin. Not every day has been good, but overall, the fishing has been much more consistent for walleyes and saugers than previous winters. 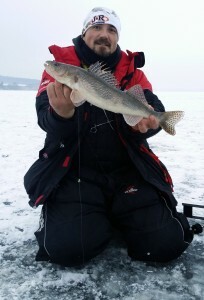 In December the bite at Okee was hot for both walleyes and some very nice pike. 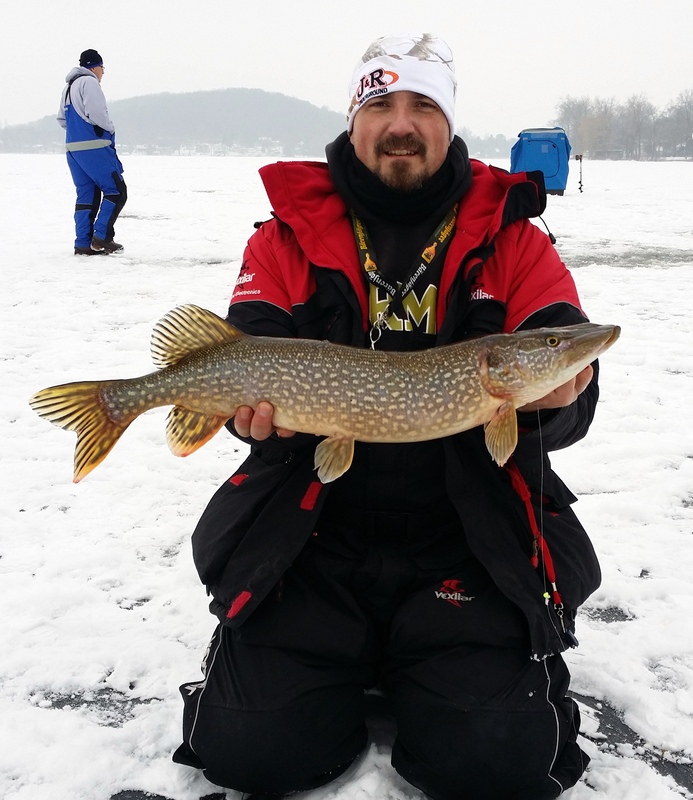 In January the saugers and crappies were biting well with some occasional nice walleyes mixed in, and now in February, it seems that crappies, walleyes and saugers are all providing action at times. Moon Valley has been getting hit the hardest lately, but there are lots of fish in lots of other locations if you’re willing to go searching. Where to look? The types of locations that seem to be holding fish consistently are points, holes, humps and channel edges. When viewing a map of the lake, look for deeper sections or “holes” in the main channel – typically 18’ to 20’ in depth on the East side of the trestle, and a bit deeper – 21’-27’ West of the trestle. Additionally, west of the trestle are a number of “humps” or small areas that are shallower than the surrounding areas. Main Lake points that jut out into the lake, often have somewhat more complex channel edges than the surrounding area. Identify these structural “irregularities” such as inside bends or hard to soft bottom transitions, and you’ll likely mark fish somewhere in the area. If you find cover such as wood in the form of trees in combination with one of these spots, all the better. If you mark a tree on your locator but not any fish, punch holes farther away from the tree in several directions. I’ve been finding that crappies will often “loosely” relate to cover, meaning their likely nearby. We’ve gotten a few warm days this winter that’s produced some snow melt. When this happens, the runoff increases the flow in the lake. Holes, humps, points and channel irregularities all can act as a form of current break during these times. Fish will hunker down out of the increased flow or even push up into the bays to escape it. #2 & #3 Rapala Jigging Raps and Jigging Shads with Kick’n Walleye or Kick’n Crappie scent added. Cool water periods are when fishing scents shine -try it, they work. Also tip-downs baited with rosy red minnows have been very productive. Using a #4 or #5 Rapala Rippin’ Rap is very effective for attracting and drawing fish to the hole. I typically drill 3 holes 18” apart, set a tip down with a rosy red hooked under the dorsal on a #12 treble hook in each outside hole, and alternate fishing with a Jigging rap and Rippin’ Rap in the hole in between them. Even if they don’t hit the lure, they will often take one of the minnows on either side. For larger walleyes, saugers and pike, a tip-up with a medium shiner hooked under the dorsal on a #10 treble hook with a 10lb fluorocarbon leader has been good for a lot of folks. Try adding a 6mm colored bead above the treble for added visibility in the dark water. The mid to late October sauger bite on Lake Wisconsin has been very good. With water temps in the low 50’s, I have been primarily targeting these fish in western half of Lake Wisconsin simply due to the fact that there are more areas with the preferred structure and depth that they are relating to. Roughly from the Village of Merrimac all the way to the Prairie du Sac dam, there are a series of bays, main lake points, and in some cases, secondary points within the bays, where we are finding good numbers of legal size saugers. These fish are fairly easy to locate with electronics and once found, are susceptible to a variety of presentations. The saugers that I have been fishing, have been loosely relating to main lake and secondary points, as well as deep flats. 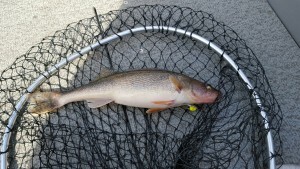 I have also been finding some fish in the main channel itself. What I have been doing to locate fish, is to slowly motor across the mouths of bays and across the associated point on each side of the bay. Trust in your electronics to show you these saugers as banana shaped “hooks” or sonar returns on your display. We are finding these fish both scattered across the bottom in 15’ to 24’, as well as in schools relating to shad. We are also finding schools of crappies suspended in these same areas from 7’ to 10’ down in 15’-24’ feet of water. These fish show up as a more “bean” shaped sonar return on my Lowrance HDS2 electronics. These crappies are catchable as well with appropriate presentations to target them. 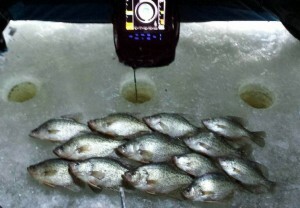 In some instances we are seeing both saugers and crappies suspended in the same area. In these cases, the fish have been relating to schools of shad. Mornings have typically been a jig & plastic or a jig & minnow bite. I have been presenting either a ¼ or 5/16th oz chartreuse colored jig tipped with either a 3” Moxi from BFISHN Tackle or a plain minnow hooked through the lips on a Northland Fireball jig. Other plastics such as ring worms will work as well, but I like the Moxi in both orange core and chartreuse pepper as it has more of a shad profile which is the dominant forage in Lake Wisconsin. I’ve been using a very subtle jigging motion to coax these bites. In cool water periods, remember to apply scent such as Smelly Jelly to your plastics. As the day progresses and the jig bite slows, I have been switching over to pulling Northland Tackle’s parakeet colored Gum-Drop floating jigs heads tipped with a minnow on a 3’ leader behind a 1.5 oz bottom bouncer to produce some extra fish before leaving an area in search of more active fish. Experiment with hooking the minnow both up through the bottom of the head, and down through the top of the head to see which produces more bites -minnow right side up or upside down. I suspect Lindy rigging would be very effective on these fish as well. While we’ve been catching a few walleyes mixed in with these saugers, if you want to target walleyes you should focus your efforts shallower in the 5’-12’ range for the next week or two. Fishing on Lake Wisconsin continues to be very good over the past two weeks. Walleyes and saugers have transitioned fully into summer patterns and while overall numbers aren’t quite as good yet as June 2013, the size of some of the walleyes we’re catching is impressive. On most ½ day guided trips, we’ve been getting anywhere from two to five slot fish (20”to 28”) including a good number of fish ranging from 4lbs to 9lbs. Last year it was fun to boat 50-60 walleyes and saugers on a full day trip, but I’ll take quality over quantity any day and since June 14, the big fish bite has really taken off. In the month of June on Lake Wisconsin, we typically employ three distinct presentations to put fish in the boat, and sometimes we’ll blend the first two options to entice a few extra fish. Pulling Slow Death rigs on bottom bouncers in 12’-16’ along channel edges. 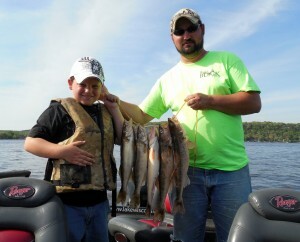 The common theme is trolling, and that is because walleyes and saugers are fairly well dispersed throughout the lake. When fish are spread out, trolling is an efficient way of covering water and contacting the most fish possible in a given amount of time. When the bite is not very aggressive, slowing down and pulling Slow Death rigs still covers water, but at a slower pace. Big fish will eat a Slow Death Rig too, and this technique was responsible for two 6lb walleyes and a jumbo 9lb walleye last weekend. Pay attention and experiment with bead color as this can dramatically affect the fish’s response on some days. Chartreuse beads have been very good overall but sometimes an orange, blue, gold or silver bead can make a big difference. Occasionally we’ll run two beads of contrasting colors. Other techniques such as jigging or even casting baits to specific structures are absolutely valid and will certainly work, but don’t expect to consistently contact the same number of fish as you would in a trolling presentation. The weather threw us some curves with an extended cold front in late May as well as some significant rain, but aside from just a few days, overall fishing for walleyes & saugers on Lake Wisconsin has been pretty good over the last three weeks. One of the keys to success in my boat, has been mobility. We all want to go back where we caught fish yesterday, or last week or even last month, but May fishing means that fish are on the move, so in order to be consistent, you should be too. 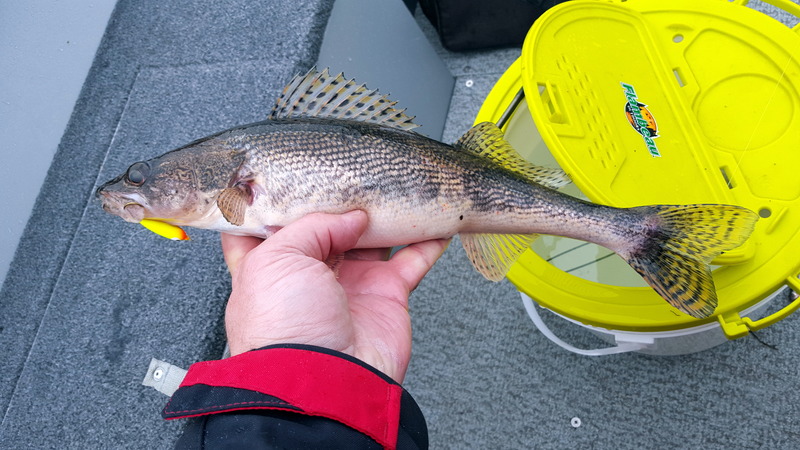 We’ve been finding walleyes mostly shallow, and saugers on the break lines, but we are getting some very nice upper slot limit sized walleyes mixed in with the eater sized saugers on the channel edges. Walleyes and saugers are transitioning from post-spawn to their summer patterns. 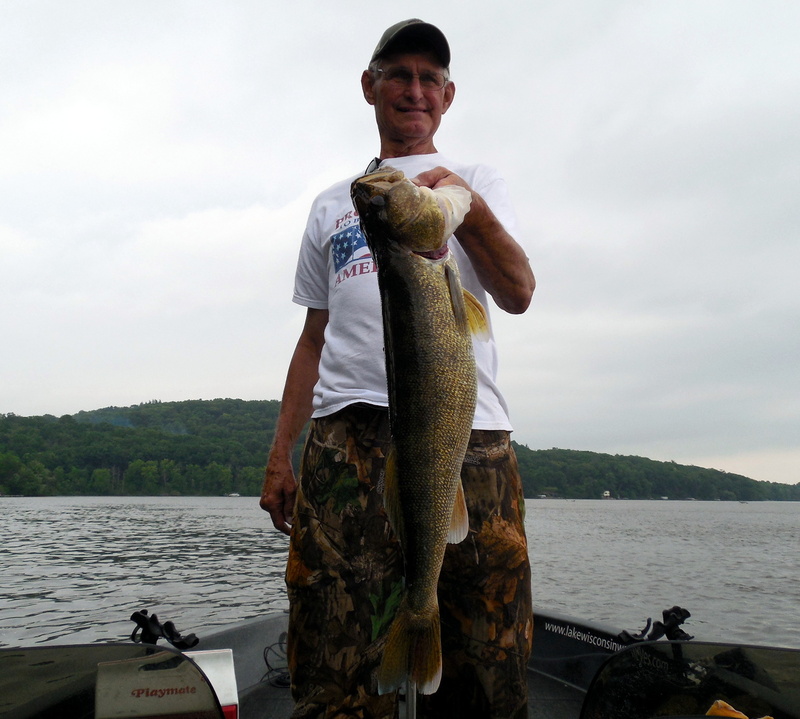 In most years during mid to late May, walleyes can be found quite shallow relating to sand. Shallow water warms faster; warm water attracts bait in the spring, and thus hungry walleyes. These fish are usually willing to hit a number of presentations such as drifting a jig & minnow or jig and crawler. A simple split shot rig or a Lindy rig can also be effective as well as one of my favorite methods, dragging a jig & plastic both up & downstream. Trolling crank baits in shallow water is another tactic that works well at times too. Many of these fish in the mouth of the river are just passing through on their way to summer locations on break lines and mud flats in the lake. Additionally, a cold front or weekend boat traffic can push these fish out, so if you are not getting bit, even if they were there yesterday – move. One of the first places to look is the first break line adjacent to the shallow flat you made contact on previously. If you mark fish but can’t get them going on a break line, switch it up and try trolling a crank bait, pulling bottom bouncers with a Slow Death rig or even vertical jig it. If you can’t get them going there, move further along to an adjacent deeper flat. Fish tend to scatter on deeper flats so presentations that cover water quickly are desirable. Nothing beats trolling brightly colored shad imitating crank baits to cover the flats quickly and trigger strikes. If you try different locations and different techniques and still continue to struggle to contact fish, go back to where you started in the morning and start all over again. Timing can be significant in fishing. As Lake Wisconsin is a dark water system, water temps tend to rise over the course of the day. Fish are cold blooded, and activity tends to increase along with the water temps during the post-spawn to pre-summer period. You may just find that the locations you blanked on in the morning are now giving up a great bite later in the day. Saugers have been very cooperative, and we’ve been routinely catching limits pulling crank baits on lead core lines on the main lake channel edges in 13’ to 17’. The bite hasn’t been all day long however, so going back over areas and pulling Slow Death rigs where we previously contacted fish with crank baits has produced extra fish. Vertical jigging with a half crawler has been working as well in 13’ -17’ depths. The May post-spawn bite has been picking up as more walleyes and saugers pass through the narrows at the Northeast end of Lake Wisconsin on their return from spawning upstream. These post-spawn fish come down out of the river in waves, and are transient, here today and gone tomorrow as they move through on their way to summer locations. Because of this constant movement, locations can be inconsistent from day to day. The best methods to locate fish are techniques that cover water such as trolling crank baits or drifting with a jig and crawler or dragging a jig and plastic presentation. You could choose to anchor on a spot and wait, but if you keep moving, odds are you’ll contact more fish in less time. Try to be versatile and keep changing it up until you find something that works. In the last two weeks I’ve caught fish a number of different ways – jigging blade baits on 10’ break lines one day, dragging jigs in 6′-8′ the next day, then pulling slow death rigs on break lines the day after that. The second half of May typically provides a good shallow water trolling bite. We need some sustained sunny days & warm nights to push fish shallow. Once this happens the walleyes will move up as that is where the bulk of the food will be. Warm South winds can have a positive effect as well as they push warm surface water to the North shoreline. 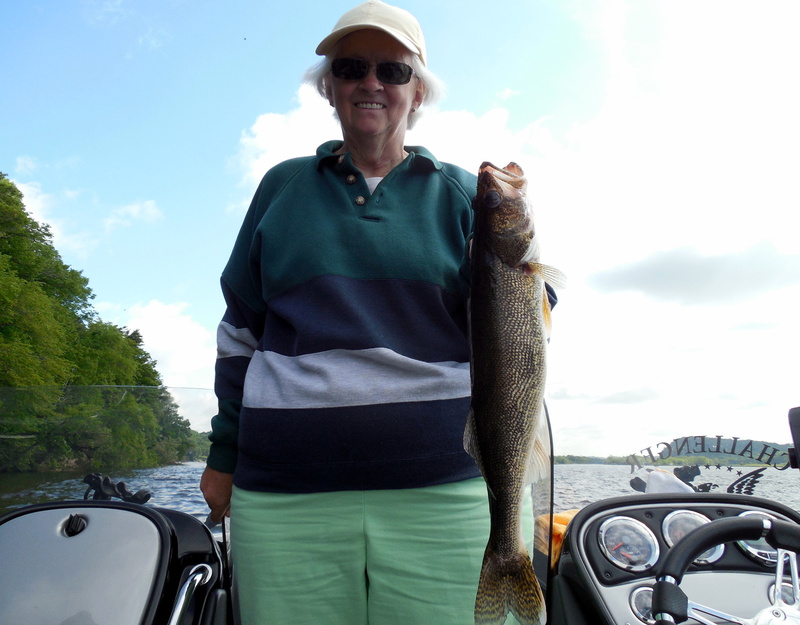 The lake, especially the shallow back bays, is warmer than the mouth of the river and some walleyes are there now as crappie fishermen are picking up walleyes here and there throughout the lake. As of Sunday, the lake was a few degrees warmer (low 60’s) than the mouth of the river (57-58). Dragging a lightweight jig & plastic in depths of 5′ to 10′ both upstream and down, can be a good presentation for walleyes when it’s sunny and warm, and especially if it coincides with lesser flow in the river, but drifting downstream with a jig & crawler or Lindy Rig may be equally productive and a more leisurely approach. Minnows still work now and it is cool enough yet to not be any trouble keeping them alive, but are not a necessity. Pulling Slow Death rigs on bottom bouncer along break lines has been producing and trolling crank baits with lead core has provided some action as well. As previously mentioned, these fish are transient and many are just moving through, so you need to keep moving and changing up techniques until you make contact. Last year the bite really turned on around May 15 and stayed that way well into July.